As customer-owned cooperatives, each of our 73 independent institutions is governed by a board of directors chosen by the customers it supports. This ensures a customer-first approach that helps U.S. agricultural producers feed the world, strengthens the rural economy, and provides jobs that help rural families thrive. We serve every part of agriculture from the smallest operations to the largest – and everything in between. Whether helping a young farm family begin, supporting our veterans as they return home and take up farming or financing U.S. agricultural exports around the globe, Farm Credit is committed to the success of American agriculture. Our loans and related financial services support farmers and ranchers, farmer-owned cooperatives and other agribusinesses, rural homebuyers and companies exporting U.S. ag products around the globe. We are part of the rural communities we serve and understand that vibrant rural communities need strong, modern infrastructure. 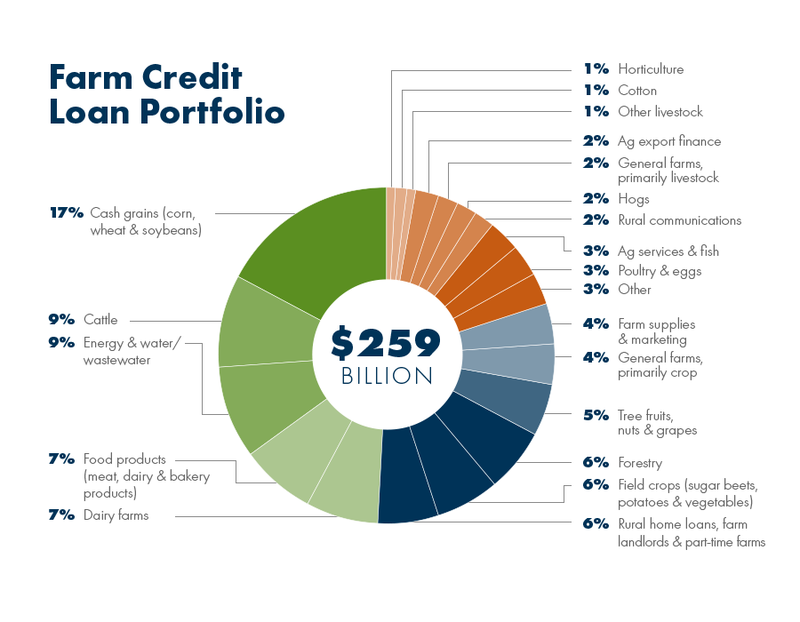 Farm Credit loans finance the rural infrastructure providers that provide reliable power, modern telecommunications, clean water, and other vital community services. Farm Credit’s mission is to support rural communities and agriculture with reliable, consistent credit and financial services, today and tomorrow. Our nationwide network of 73 customer-owned financial institutions offers a wide range of financial products specifically tailored to the individual needs of agricultural producers, farmer-owned cooperatives and other agribusinesses, commercial fishers, rural homebuyers and rural infrastructure providers. Farm Credit’s financial strength means that our customer-owners have access to the most up-to-date loan products available, from the smallest loan to a farmer just starting out to a large multi-lender loan syndication needed to bring broadband to an entire rural community. For agricultural producers we make loans to buy land, operate farms, purchase equipment, build facilities and much more. We offer crop insurance, credit life insurance and other financially related services. For farmer-owned cooperatives and other agribusinesses, we make loans to acquire land, build facilities, purchase inventory, extend credit to customers, export products and more. We also offer cash management services and other financially related services. We offer specialized leasing programs so our customers can lease equipment, facilities, rolling stock and more. We make loans to individuals and families to purchase homes in rural areas. We make loans to rural infrastructure providers to support operations, acquire/build facilities, support mergers and acquisitions, finance individual projects and for general corporate purposes.